Beam Me Up Scotty! Find all 25 of the Star Trek characters, space ships and related terms in our newest movie word search. 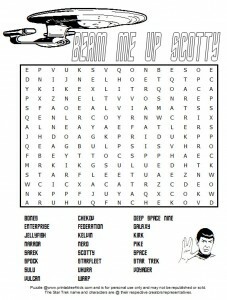 The word search activity also makes a perfect addition to a Star Trek or space themed birthday party. Need more Star Trek printables? Visit our friends at SpaceJr. for some cool Star Trek coloring pages and solar system for kids activities.